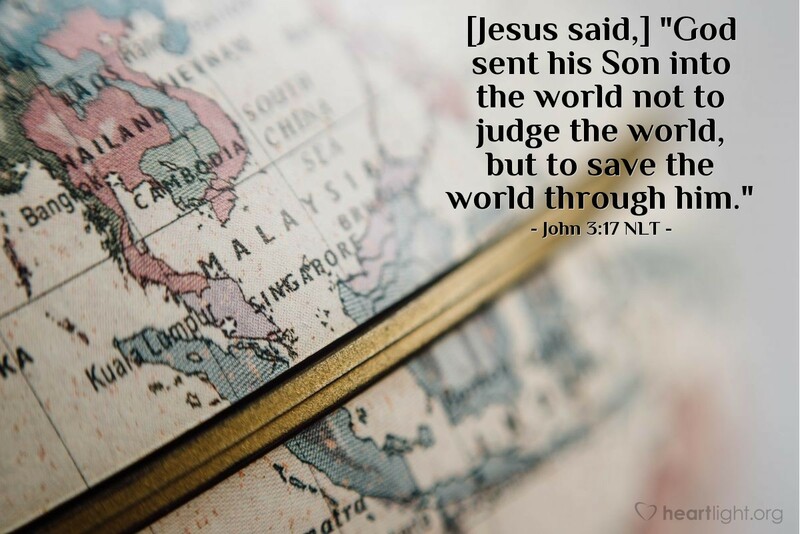 [Jesus said,] "God sent his Son into the world not to judge the world, but to save the world through him." The world stands under the shadow of destruction. Were it not for God's love for us in Jesus, we would face that same end. God, however, is the Creator, the Life-Giver, and the Joy-Bringer. The goal of his holiness is not destruction, but redemption. The goal of his righteousness is not anger, but salvation. Jesus came to our world, a world headed for destruction, and placed God's stamp of grace upon it. He came to reverse the powers of decay, death, and destruction and put in their place permanence, life, and salvation. Jesus is God's great reminder to us that he not only loves us but that he also has only good and glorious intentions for our lives and our eternal futures. O God, redeem my view of you and your intentions for me, just as you have redeemed my soul from sin. I confess that my view of you is so limited and earthbound. Through your Holy Spirit, fill my heart with an accurate, glorious, and gracious understanding of your intentions for my life. In Jesus' name, I pray. Amen.